Each Fall I create a unique limited-edition calendar containing some of my favorite images captured during the past year. I try to include a mixture of landscapes, plants, and animals and also try to match the image with the season as best I can. 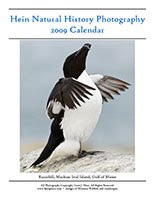 The calendar is printed single-sided on 8.5×11″ cover stock and is spiral bound at the top. I only print a small number of these unique calendars. I also create a separate “Images of Diablo” calendar for Save Mount Diablo that is a gift to supporters who make an end of year donation of $250 or more. © 2008, Scott Hein. All rights reserved. Scott Hein is a freelance nature photographer whose passion is photographing the native plants, wildlife, and landscapes of the American West. Although his explorations have taken him from Alaska to Antarctica, the wild lands and parks surrounding Mount Diablo near his home in Northern California remain his favorite photo locations. This entry was posted in Heinphoto News, Photography, Save Mount Diablo. Bookmark the permalink.